Cedar Park's OBOB team, Fiction Addiction, finished third at the State OBOB Tournament in Salem last April. The road to State was a long road of perserverance and dedication. In order to qualify for the State Tournament, Fiction Addiction had to first win the Cedar Park championship. From there, they fought through the Regional Tournament in March, where they advanced to the top two regional teams and secured their place at the State Tournament, along with Stoller, Meadow Park, and St. Helens Middle Schools. Only 16 teams from across Oregon qualified for the State Tournament. Once at the State Tournament, Fiction Addiction won two battles before losing in the semi-finals to John Muir. However, they bounced back to win the consolation battle, placing third. 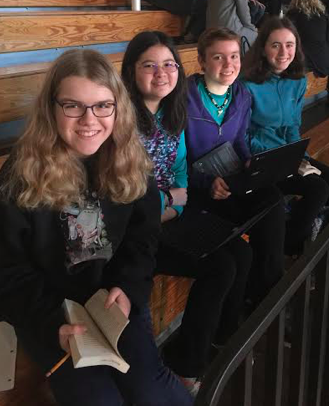 Congrats to Fiction Addiction eighth graders Aila (Ash) H., Tierney G., Anouk C., and Claire K. for an incredible OBOB season. Thanks is also due to Cedar Park LMA Debbie Hernandez and all our CPMS OBOB volunteers.